« Aunn Zara – So long, and thanks for all the fish. 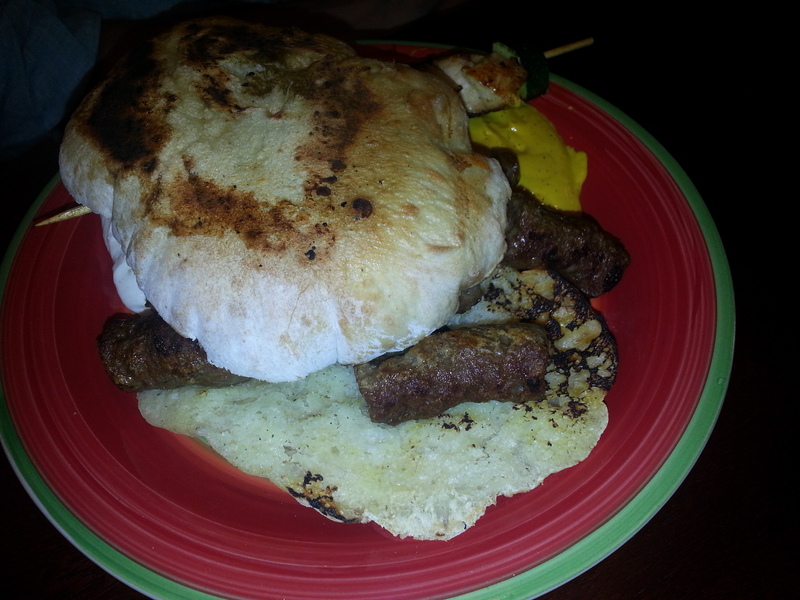 Ever since we heard about Euro Grill serving up halal Bosnian food, TBH and I have been plotting a trip to get there. We planned some degree of working up an appetite beforehand so we could indulge in what we assumed would be hearty meaty options and halalelujah Euro Grill doesn’t disappoint. We landed there ravenous at a rather odd time though we were warmly greeted by the owner who made us feel at home. It truly did feel like we had dropped in on a friends’ charming and cozy place (and open kitchen! note to self: these are the kinds of friendships to pursue). We entered via the back entrance which had ample parking and temptation in the form of the Euro Market which was unfortunately closed by the time we were done with our meal but since we are showing signs of slobbering Pavlovian responses at the mention of Euro Grill, fear not, we shall return to pay their European goodies a visit. The menu is a meat lovers delight with traditional Bosnian fare such as Ćevapi (sausages and more sausages), Sarma (minced beef wrapped in cabbage leaves) and Goulash on offer. We opted for the Ćevapi (um, probably because when TBH asks me for sausages, I take my own sweet time, something like three years) which was ten sausages in a lepina (pita type bread) with sour cream, onions and ajvar (a red pepper relish) so in other words, a sausage fest…umm, ok a halal sausage fest. We got the chicken skewer as well for PFC and between the two and a half of us, there was enough to feed a small nation. 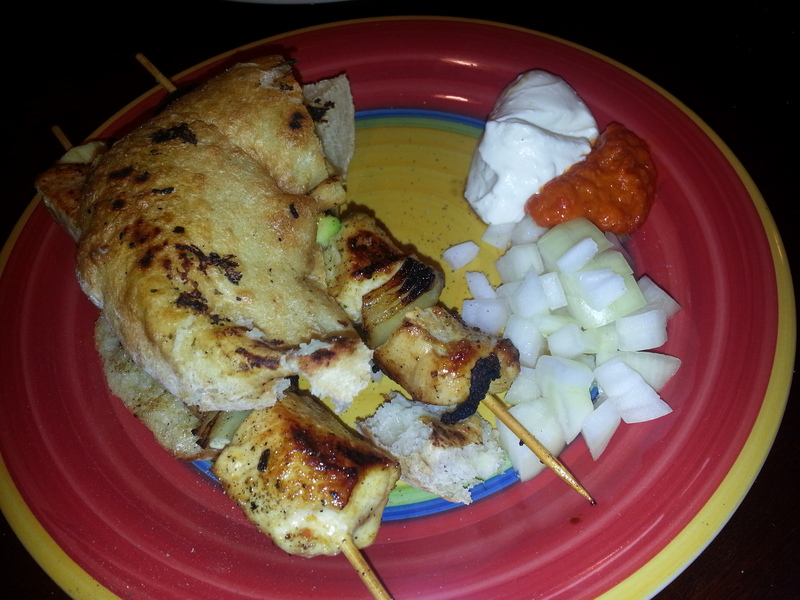 The chicken skewers were grilled with a lovely char to them and were perfectly moist and smoky so PFC was chomping it down with that wonderful bread. The sides were also stars of the show,– did I mention the lepina? It’s fluffy home baked bread that you’ll have a hard time not polishing your plate off with for good measure, and the red pepper spread –ajvar-was also bright and tickled the palate with a peppery lemony taste. We were served the mild version, however, the owner possibly noticing our desi-ness mentioned a pick of the spicier versions in their Euro Market too. Loads of folks around us ordered the Pljeskavica which is a large hamburger, or really, a hamburger the size of your head which pretty much advertises heart attack on a bun. But, hey, you would die really, really happy and full. Maybe next time we’ll try it – when we walk there and back to be able to justify it or can split it five ways. Since a lot of Bosnian cuisine is a melting pot of both Middle Eastern and Western cuisine, it is interesting to note the similarities in the names of the dishes. A fun connect the dots mental exertion since you know, we were slowly going into a food coma. Ćevap comes from kebab, Sarma , similar to dolma and apparently means “wrapped thing” in Turkish. Ajvar the red pepper relish is eaten similar to achar, and Ćufte or meatballs is similar to kofte. See, full tummy and word association! Just as the food coma was making us blissfully sedate and numbing our reaction-time, the owner comped us not one, not two but three free dessert crepes! 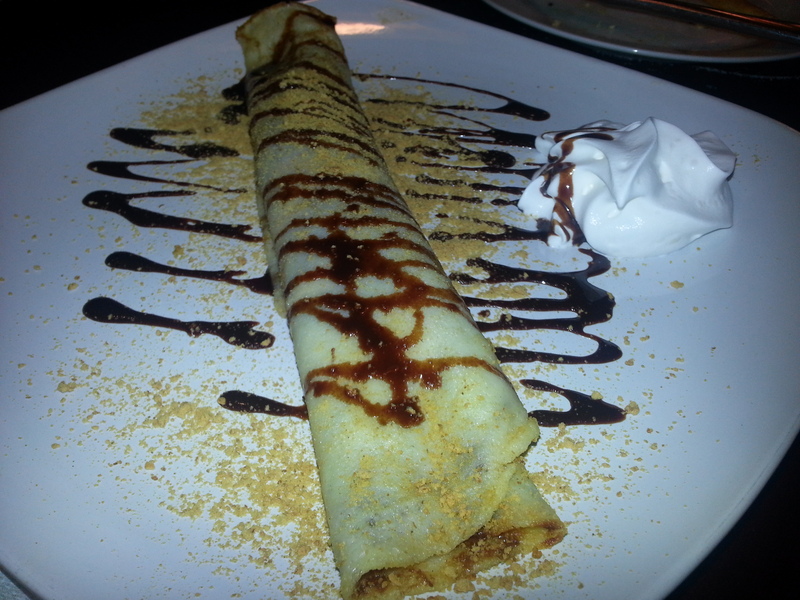 We groaned in protest (seriously three free crepes – what is that doing to your bottom line?) but like all wonderful pushy generous hosts, he waved away our weak indecipherable moans (I get the feeling he’s done this many many times before) and placed three tempting plates in front of us. It was hard work but we managed to do justice to the very warm and chocolate-ly oozing goodness of nutella crepes sprinkled with ground peanuts. And he was just getting the party started apparently everyone in the restaurant (ok the four other folks there) got free dessert as well. A warm welcome, great portions, meat and more meaty goodness, finger licking dessert and generous and hospitable hosts who truly make you feel like family. What’s not to love? Here’s to plotting our return there soon. Now, if we can only make it to the car….